A parliamentary report of 1777 listed parish workhouses in operation in Steyning Borough (for up to 18 inmates), Beeding (14), Poynings (20), New Shoreham Borough (20), and Sompting (15). 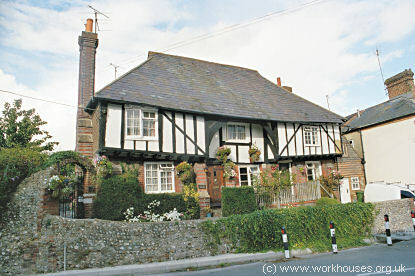 A medieval timber-framed building on Mouse Lane in Steyning served as the parish workhouse. 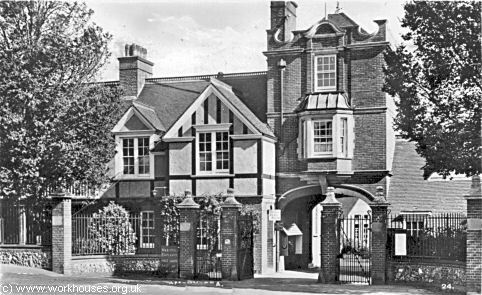 Steyning old workhouse building, early 1900s. The former workhouse survives and has been converted to cottages. Henfield's parish workhouse was erected on Nep Town Road in 1736 and continued in use until 1837. 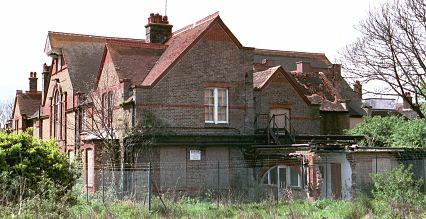 Henfield former parish workhouse, 2004. Preston had a parish workhouse sited immediately west of the Crown & Anchor and occupied a small thatched building with flint and brick walls. The building was demolished in 1844. Sussex: Aldrington, Ashurst, Beeding, West Blatchington, Botolphs, Bramber, Coombes, Edburton, Hangleton, Henfield (3), Hove (3), Kingston-by-Sea, Patcham, Portslade, Poynings, Preston, Shermanbury, New Shoreham (3), Old Shoreham, Sompting, Southwick, Steyning (3), Woodmancote. Later Additions: Fulking (from 1894), Lancing (from 1869). The population falling within the union at the 1831 census had been 11,071 with parishes ranging in size from West Blatchington (population 58) to Henfield (1,516) and Steyning itself (1,436). The average annual poor-rate expenditure for the period 1832-35 had been £9,339 or 16s.10d. per head of the population. 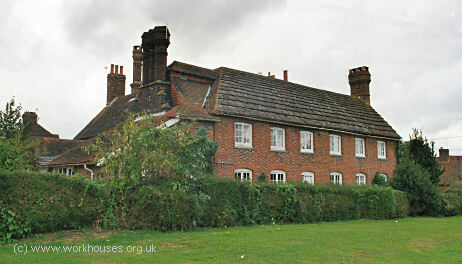 Steyning's first union workhouse, designed by a Mr Elliot, was built in 1836 on a two-acre site on Ham Road at Shoreham-by-Sea near the railway station. It was built by Mr W Brooks at a contract price of £3,850 for which a thirty-year loan of £4,300 was taken out by the union. The workhouse location and layout are shown on the 1875 map below. Later additions to the buildings included infirmaries in 1870, 1880, and 1893, vagrants' wards, and a chapel. However, by the 1890s, its accommodation and facilities were decided to be inadequate and plans began to erect a new establishment at a much larger site at Kingston-by-Sea. 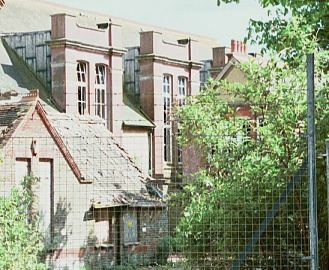 The old Shoreham workhouse site was retained by the union and adapted for use as a children's home known as St Wilfrid's. Initially 42 children were accommodated in each of what were referred to as the Old Infirmaries and 36 in the New Infirmary. These became known as Home 1 (for older boys), Home 2 (under-eights), and Home 3 (for older girls). 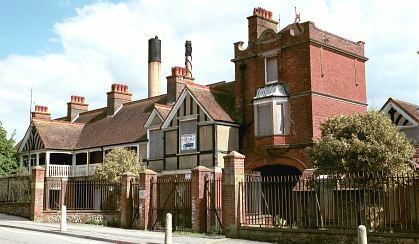 The old workhouse buildings at the west of the site were subsequently demolished. St Wilfrid's girls' block, just prior to demolition. The children in the homes wore a grey uniform and yellow and black striped tie, with black boots for the boys, and a pinafore and lace-up boots for the girls. Children got up before 7am and did household chores such as polishing floors before breakfast at 8am. Bedtime was at 8pm although the young children were woken at 9pm to go to the toilet. Anyone wetting the bed was paraded around with the wet sheet around their head and then given a cold shower. In 1907, a total of 127 children were in the homes although there were only 92 cots and beds so some bed-sharing was taking place. Boys were taught carpentry and shoemaking, while girls were prepared for domestic service. A boys' drum and fife band was started by the industrial trainer in 1905 and the band sometimes played at local functions. Some boys from the home went on to join training ships such as the Formidable and Exmouth. Visiting at the homes was severely restricted. Parents who were in the main workhouse could visit their children once every six weeks, mothers on Saturday afternoons, and fathers on Sunday. Parents outside the workhouse could visit every three months on special application to the Superintendent. In 1917, St Wilfrid's became home for four-year-old John Cecil Austin. John remained at the home until he reached the age of fourteen and his memories of his time there, kindly contributed by his daughter Pat Mathewson, provide a revealing insight into life in the establishment. As well as the main homes site, the union also operated children's "cottage homes" just to the north of St Wilfrid's — two in Gordon Road and four at the east end of Rosslyn Road. In 1896, a 23-acre site on the Shoreham to Brighton Road at Kingston-by-Sea was acquired by the Steyning Guardians at a cost of £2,300. Construction of the new buildings began in August 1898. The initial building contract of £48,500 was won by Messrs J Parsons and Sons of Church Road. The design, by Messrs Clayton and Black, was based on a pavilion plan layout, with an administrative block at the centre, men's pavilions to the west, and women's to the east. Following completion of the construction work, the buildings were due to be officially opened on 26th September 1901. The local ratepayers were invited to inspect the premises during the third week of September. However, because of the death of the Chairman of the Guardians on 10th September, no formal opening took place. The transfer of inmates from the old workhouse took place on October 1st. 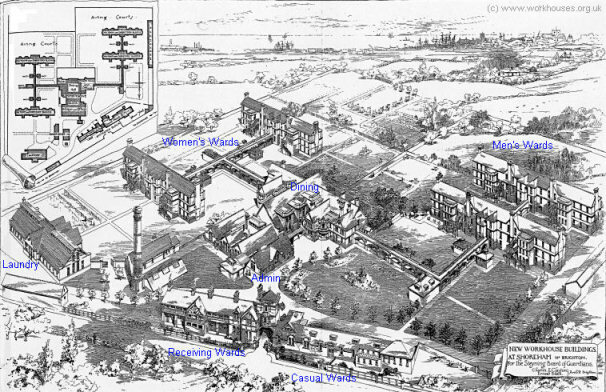 Steyning workhouse bird's-eye view, 1898. An entrance block stood at the north of the site, fronting onto the road. At the west of the entrance archway lay tramp wards for 21 males and 20 females. There were 10 male cells with stone-breaking cells adjoining, plus a general ward for 11 men. The women's accommodation comprised 4 cells able to accommodate a mother and child, plus a general ward for 6 women. By 1905, the vagrants' accommodation was proving inadequate and a bell tent had to be hired as a temporary arrangement. Steyning entrance block from the north, 1950s. At the east of the entrance arch was a receiving ward in which new inmates could be isolated for a few days. The entrance block also contained a porter's lodge. 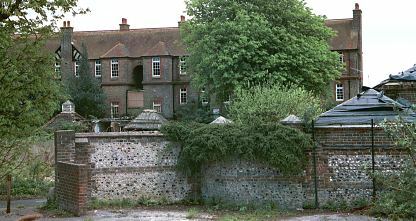 Steyning entrance block from the north-west, 2001. The administrative block included the Master's quarters, offices, kitchens and dining-hall. Steyning former administrative block from the north-west, 2001. Steyning administrative block from the east, 2001. The men's blocks accommodated a total of 240 inmates. Each block included day rooms on the ground floor with dormitories above. Steyning male pavilion from the north-west, 2001. Great efforts were made to keep men and women strictly segregated, with the installation of "unclimbable" fencing in 1905. However, men were still caught climbing over the barrier and a female inmate had a second illegitimate child whilst in the care of the workhouse. An inquiry into how male and female inmates were managing to pass message to one another discovered that they were in fact just using the general postal service! 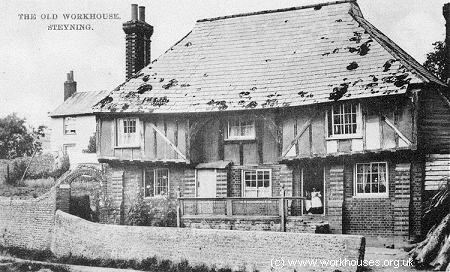 From 1904, to protect them from disadvantage in later life, the birth certificates for those born in the workhouse gave its address just as 2 Upper Shoreham Road, Kingston-by-Sea, Shoreham. In September 1906, four additional ward blocks, known as the New Hospital, were opened at the east of the site. In 1918, 16 acres of the workhouse gardens were cultivated by German prisoners of war. The union had to pay 5¼d per hour for them and they were given tea, coffee, or cocoa at midday. 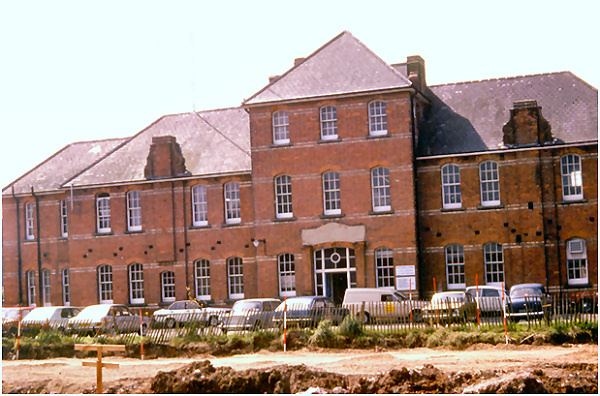 After 1930, the workhouse was taken over by East Sussex County Council and was renamed Shoreham Institution, then Southlands Hospital in 1933. By the end of the twentieth century, the old workhouse blocks had become disused. The site has now been redeveloped for housing, although the old administrative and roadside buildings still survive. East Sussex Record Office, The Keep, Woollards Way, Brighton, BN1 9BP. Holdings include Guardians' minutes (1835-1930); Births register (1914-1930); Deaths register (1890-1930); Inmates register (1882-1930); Admissions and discharges (1903-30); etc. Southlands Workhouse and Hospital by the Reverend John White (1990).